The author talks about how Nag Ashwin's Savitri biopic, Mahanati/Nadigaiyar Thilagam, doubles up as a visual retelling of the history of South Indian cinema. Keerthy Suresh as Savitri in 'Mahanati'. Nag Ashwin, first and foremost, is a fan of cinema. His Mahanati is a tribute to one of the greatest Indian actors, Savithri, played with perfect, minute refractions through its 176-minute run by Keerthy Suresh, an actor who has exponentially strengthened her resume with this one film. And Ashwin, in crafting this love letter to Savithri, encloses a post-script to cinema of a bygone era and the people at the centre of that early movement. He doesn't do it by way of a costume drama where the camera simply follows events in their chronological order. Ashwin adorns them. He loves to build the myth with his shots, with his lighting, with his references and parallels. 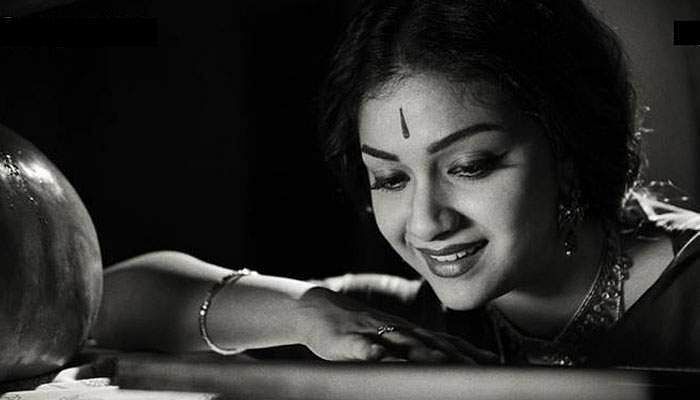 Mahanati is about Savithri, but it is also about Indian cinema and more importantly Telugu (and Tamil to an extent because during Savithri's most successful years, they were all based in Madras) cinema. What Mahanati shows is coded within how they are showing it. Mahanati is a Savithri film first, Keerthy Suresh film second, and a lovely ode to cinema of that era, third. 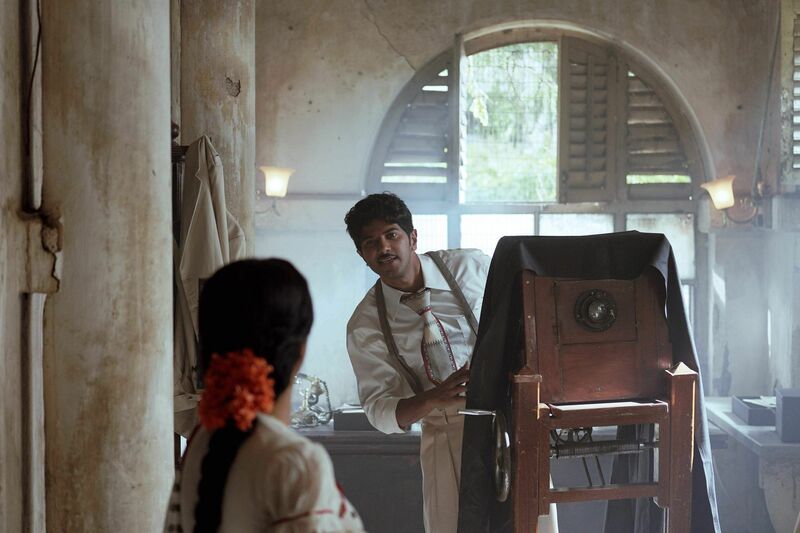 In some of Ashwin's blocking, framing and shot techniques, it is apparent that the director is an unabashed Mani Ratnam fan. 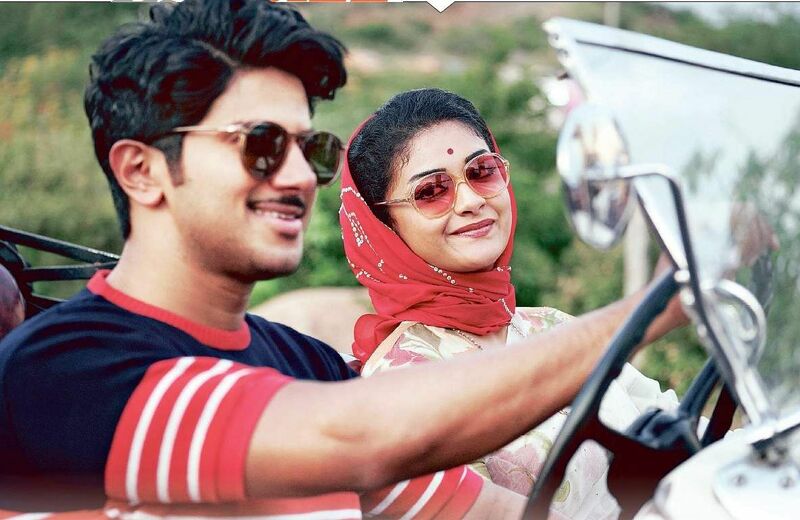 Mani Ratnam recreated the same era in Iruvar and some of the notes seem to have found their way into Mahanati. Forget the ode in the scene where Ganesan (Dulquer Salman) holds Savithri's (Keerthy Suresh) hand in her terrace and brings her to face the crowd of fans that is waiting below for her. That is a straightforward shot from Iruvar. Consider the scene soon after Ganesan reveals to Savithri about his marriage to Alamelu and his relationship with Pushpavalli (this scene too is filmed amidst crashing waves, strong enough to topple the couple over). They are framed atop a temple structure, standing on opposite sides at either ends of the frame. In between them is an idol at ground level and burning fire. The moment at once takes mythological resonance, and every word uttered and movement made, portends something turbulent. It is powerful in terms of filmmaking but Ganesan is clearly employing his gaslighting methods over a woman who is much younger to him. In real life, the couple got married in Chamundi temple. It is worth noting that the temple structure is the site of a film set, the film within the film. A sham, as clever as any. 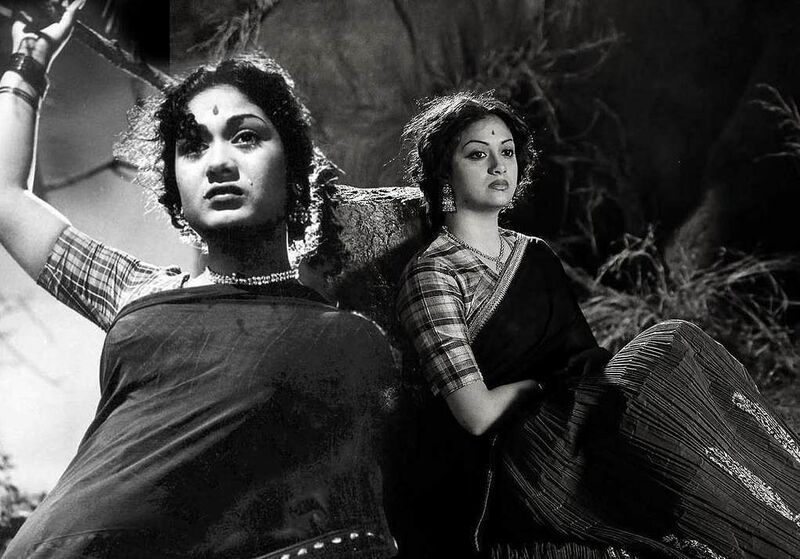 Mahanati wraps in some Savithri love in other subtle ways. The framing device Nag Ashwin and screenplay writer Siddhaarth Sivasamy use is set in the 80s, shot on grainy 16mm film, involving a journalist and her photographer played by Samantha Akkineni and Vijay Devarakonda. They go about interviewing various characters in Savithri's life but develop a love story of their own. At the outset, this seems jarring and unnecessary, especially for an almost 3-hour-long film. But the detail is in their backgrounds. 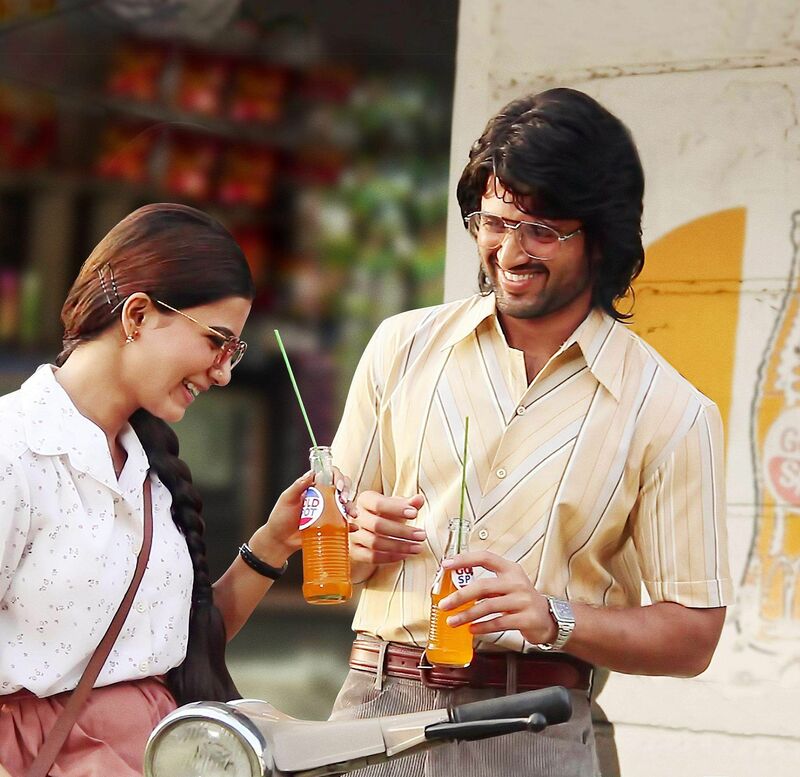 Samantha, Vijay Devarakonda in Mahanati. Samantha is Madhuravani (Savithri's character in Kanyasulkam) and Vijay Devarakonda is Anthony. Their inter-religious romance is played up and it has a parallel in one of Savithri's greatest films - LV Prasad's Missiamma. In the film - a romantic comedy ostensibly - Gemini Ganesan plays Balu and Savithri plays Mary, two individuals who are trapped by the unemployment of that time. To solve their woes, they apply to a school which is looking for a husband and wife pair as headmaster and teacher respectively. Balu and Mary decide to pretend to be a married Hindu couple and take the job. The inter-religious romance of Balu-Mary finds an echo in the inter-religious romance of Madhuravani-Anthony. Ashwin goes ahead and includes an offhand moment where we see a protest from the 1950s demanding a separate Andhra state when Savithri and Ganesan are driving through the city. In Madras Studios: Narrative, Genre and Ideology in Tamil Cinema (SAGE India), Swarnavel Eswaran Pillai writes on Savithri's performance in Missiamma: "(she) delicately sketches Mary's predicament as a representative of the minority whose voice is not heard in the zamindar household". Ashwin chooses to doff the hat to people like LV Prasad and Aluri Chakrapani who, through even entertaining comedies and romance, encapsulated social commentary about their place as outsiders in Madras, at the height of the Dravidian movement. The final hat tip from Ashwin comes in the form of something that was the bloodstream of that era's cinema. The songs. Recently, we have seen Hollywood directors craft loving ballads on screen, recalling cinema of a golden period -- in La La Land and The Shape of Water. In Mooga Mansulu, Ashwin celebrates something enthralling, arresting and fantastical. The song comes at the height of Ganesan and Savithri's love, that is shown as otherworldly. Seldom does ground exist beneath their feet as they reach for the heavens through clouds, sky and even via a ladder that reaches up to the moon. One might be turned off by the garishness of cinema of a certain time or be averse to the idiosyncrasies of mainstream Telugu cinema. But how can one turn away from the unadulterated love that the creative minds of Mahanti bestow not just on Savithri but also on the history of her cinema. With a dignified look at the past, Nag Ashwin, only two films old, commands respect for the future.